“Healing of the Blind,” detail of the Resurrection window by Harry Wright Goodhue, 1929. A sermon for the Twenty-Second Sunday after Pentecost, October 25, 2015. The lectionary readings are Jeremiah 31:7-9, Psalm 126 , Hebrews 7:23-28, and Mark 10:46-52. We often hear the old phrase, “seeing is believing.” It suggests that evidence, proof, and justification all lay a foundation for credibility. “Seeing is believing,” we mumble when we hear the promises of a politician. When we hear that improvements are coming on the Red Line (Metro), “Seeing is believing,” and when it looks like the Chicago Cubs might make it to the World Series… well, you know…….. Sometimes we feel like we have to see the result, the promised end, the activity completed, before we can believe what has been promised. But today’s Gospel challenges us to do something else—to believe, first. It encourages us to step out, to move forward with belief, and then to trust that our belief will take us to a new place of seeing. The story we heard a few minutes ago about Bartimaeus takes place as Jesus is on his way to Jerusalem. It is near the end of Jesus’ earthly ministry. All this time, Jesus has been telling his disciples that the kingdom of God is in their midst—right in front of them— if they will only see it. He tells them about God’s love for all people, if they’ll just notice it. Jesus tells them that they (and we) will all see God, one day. But the disciples keep scratching their heads, trying to understand, trying to make it all fit together, trying to make sense out of what Jesus is doing in their midst. The disciples here are a little like a person who sees a rainbow, but then runs inside to get the camera. By the time they’ve returned, the rainbow is gone. Over and over again the disciples miss the miracle because they’re reasoning, or arguing, or trying to predict Jesus’ next move. Jesus hears the faith in Bartimaeus’s voice. Jesus hears his desperation and his suffering. Jesus asks, “What do you want me to do for you?” And Bartimaeus says, “let me see again.” Jesus says that the man’s faith has made him well, and so sends the man off. 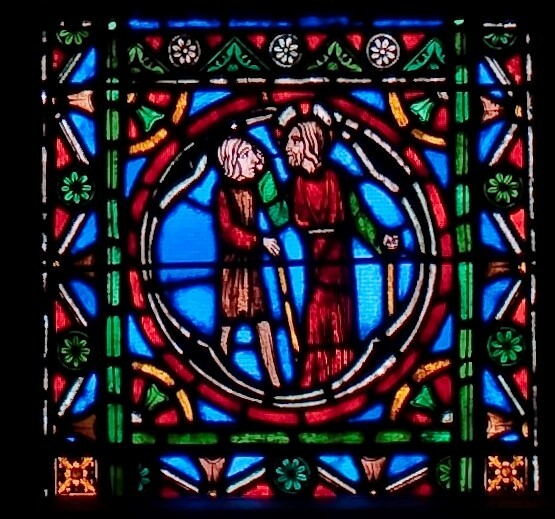 Bartimaeus regains his sight, but instead of going off, he begins to follow Jesus, instead. But healing in our world doesn’t always come that quickly or easily, does it? Too many of us, too many we know, have wrestled with sickness or a broken family relationship, grief or addiction for too long. Perhaps we have asked for help with just as faithful prayers as Bartimaeus. And yet, the healing hasn’t happened yet. The people who heard Jeremiah’s words so long ago, words we heard in our first reading this morning, must have been a little cynical. What evidence did they have that God was truly going to help them return home? Uprooted, robbed of home and livelihood, a people turned into refugees, how should they hear these happy words of Jeremiah? I think they were able to hear them with faith. There is a place—a holy place, in fact—that exists somewhere between seeing and believing. That middle place is the place of faith. With faith we wrestle, we listen for God, we cry, we might yell and scream at God. But we also notice, and we begin to hear, little by little, the whisper of God’s voice. We feel the nudge of God’s hand reaching for our own, to pull us into some new place. For Bartimaeus, faith made him well. For us, faith can keep us alive in God especially when we can’t quite believe, and especially when we can’t quite see what God would have us see. Faith makes us well. But sometimes faith can seem like an empty promise. People can have a variety of reactions to our faith—they might think us naïve, uneducated, fixated on a divine parental figure, or any number of things. And then, sometimes people simply laugh. But as scripture shows us, laughter sometimes opens the way for God. Frederic Buechner remembers the old story of Abraham and Sarah, when the three angels tell Sarah that she’ll have a child, at the age of ninety. He recalls that Abraham “falls on his face and laughs.” And Sarah laughs too. And so, when she gives birth to a son, it’s no wonder that she names the child “Isaac” or, “laughter” in Hebrew. Buechner says that faith is surely the “assurance of things hoped for, the conviction of things not seen” [as the Letter to the Hebrews puts it] but faith is also about laughter at the outrageousness of God’s work in our world. People often laugh when they hear hopes born of faith. Back in 1911, they laughed when Father Sterrett wanted to form a new congregation in Woodley Park, but he and those first few had faith. Through the Depression, through good times and bad, through the AIDS epidemic, through changing demographics… people have laughed (and cried) at the prospects for this congregation. But the people here had faith and that attracted more. Of course, a lot of people laughed when we set out to build the addition—just after the 2008 recession, with limited funds, with no huge single gifts… but we had faith and with God’s help and a few minor miracles along the way, we made it. When people hear some of my hopes for this parish, they continue to laugh. Even though I’ll be leaving you next month, I have plenty of hopes and prayers for All Souls. I imagine a full Sunday school, and perhaps even an afternoon music school during the week. I imagine you completely gutting the administration building and making it more user friends and space-flexible for the 21st century. I can almost hear a new pipe organ, and I can easily see continuing to make our space more accessible. Just as it wasn’t always easy to stay faithful in the past, there will surely be challenges in the future. New and different priests, with new and different strengths and weaknesses. New visitors and members and gifts and abilities. You may laugh, but as Buechner reminds us, “The reason [Abraham and Sarah] laughed was that it suddenly dawned on them that the wildest dreams they’d ever had hadn’t been half wild enough” (Peculiar Treasures, 153). And so we live between seeing and believing, in the place of faith, grateful that it is also a place of laughter. It is filled with laughter because God is doing amazing things among us, and if we allow our faith to move us forward, we will come to that place where we laugh together, we laugh loudly, and we laugh with God into eternity.